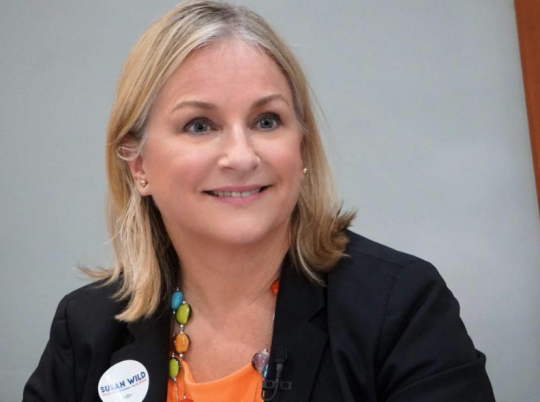 Pennsylvania congressional candidate Susan Wild touted her support on Twitter from a group that has previously advocated population control before ultimately deleting her tweet and calling the matter "a distraction." Wild said she was "honored" to receive the endorsement of the Population Connection Action Fund, formerly Zero Population Growth (ZPG), which in the past condemned "irresponsible breeding" and called for excessively taxing large families. In the 1960s, the group said its goals were providing government funds for abortion and implementing heavy taxes on families with more than two children. "No responsible family should have more than two children," ZPG said in a brochure from the time. "Irresponsible people who have more than two children should be taxed to the hilt for the privilege of irresponsible breeding." The group’s co-founder Paul Ehrlich advocated abortion as a means of population control. Abortion is a "a highly effective weapon in the armory of population control," he wrote in his book The Population Bomb. Population Connection Action Fund changed its name in 2002 and now says it does not want to dictate how many children families have. Wild still deleted her tweet touting the group’s endorsement. 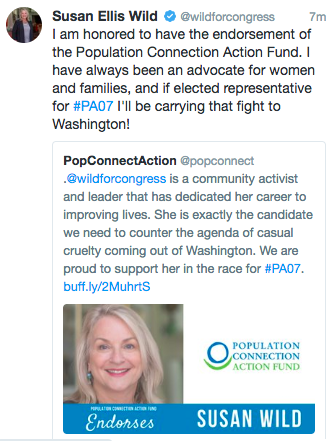 "I am honored to have the endorsement of the Population Connection Action Fund," she wrote in a tweet reproduced below. "I have always been an advocate for women and families." National Republican Congressional Committee spokesman Chris Martin drew attention to Wild’s tweet by bringing up the organization's past positions on families. "Out of curiosity, how many children does Susan Wild think families should be able to have before they’re taxed to the hilt?" he wrote in an email. Wild’s campaign said the endorsement had become a "distraction" and took down the tweet. Megan Caska, a spokeswoman for Wild, also hit back at Republicans and said the candidate simply wants to support working families. "I'm not surprised that the national Republicans are trying to divert attention from her opponent's anti-woman stances and his recent media attention." Caska said. "But arguing that Susan is somehow an advocate of ‘abortion as population control’ is not a strong message in a district that is so focused on the concerns of working families." As ZPG, the organization had focused on lobbying Congress to pass legislation incentivizing smaller families but now focuses on access to abortion and contraception and does not seek legal punishment for larger families. The group advocates increasing foreign aid for family planning and an end to the Mexico City policy, which prevents government money from going to groups that perform or promote abortion. "We do not advocate for increasing taxes on parents of any size family. We believe that parents should have exactly the number of children that they want," said Brian Dixon, a media and government relations executive for the Population Connection Action Fund. Wild is running to represent Pennsylvania's 7th Congressional District. She faces Republican Marty Nothstein, an Olympic medalist and current chairman of the Board of Commissioners of Lehigh County, Pennsylvania, in the November general election. This entry was posted in Politics and tagged 2018 Election, Abortion, Pennsylvania. Bookmark the permalink.